Transportation Costs > How Much Do PODS Cost? 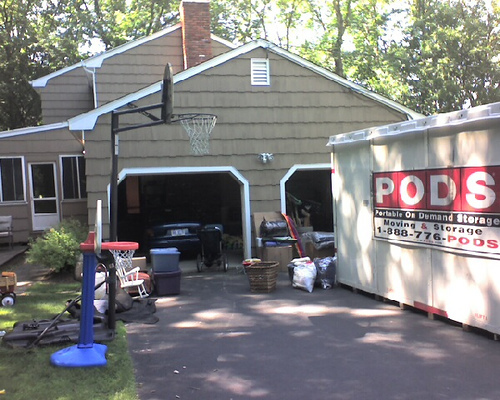 PODS, also known as portable on-demand storage, is a great way to move your home or business at your own pace. PODS can be delivered to your home or office and are left there until they are requested for pickup, and these PODS can be used in various ways. For example, if you are renovating your home or office, they can be used to temporarily store your furniture and belongings. Once the renovation is completed, the empty Pod will be picked up and taken away. If you are moving from one location to another, PODS can also make the job easier. Rather than having a moving van come to your home and only having one or two days to move all of your things, you can gradually fill the Pod with the belongings to be moved. Once the pod is loaded, a driver will come, pick up the pod and take it to your destination. There are PODS of all different sizes that can be rented depending on the number of items you need to store, and this is one of the factors that can greatly affect the cost. If you are having the Pod moved from one place to another, the mileage will also determine the final quote. How much do PODS for moving and/or storage cost? For local PODS orders, there will be a delivery fee and then a per-month charge. On average, PODS are going to cost around $100 to $225 for the delivery charge alone. For every additional month that you need to store the Pod on your property to store items, it can cost anywhere from $100 to $200 per month. This price will come down to the size of the storage area. For example, if you had a Pod delivered locally and stored it for one month, you would pay around $150 per month for a 12-foot POD with a $110 delivery fee. To deliver it to your new location within 25 miles, another $150 would be tacked on. In the end, you would probably have to budget around $400 to $450 for a complete round-trip move. Your results will greatly vary, but these were quotes we received when we had filled out a form on the website. For any trip over 100 miles, by playing around with the quote engine, it looks as if you should budget a total of $6 to $9 per mile for a complete delivery, month of usage and delivery to your new location. This is not going to include more than one month. Again, the destinations are going to vary greatly. On this City-Data.com forum thread, for example, members had talked about what they had paid when they rented a Pod storage unit. With more than 70 replies, most, depending on the factors mentioned above, had paid anywhere from $100 per month for storage to $1,400 for a move from New Jersey to North Carolina. HireAHelper.com, for instance, listed the average prices for moving container companies. According to their research, the average PODS local move is $605, whereas a medium move will be $1,532. A long-distance move was $3,302. To get an exact quote for your specific move, visit PODS.com. Refer to our table below to see some of the quotes we had received. The company offers a 7-foot ( 7 x 7 x 8 (1-2 rooms)), 12-foot (12 x 8 x 8 (2-3 rooms)) and 16-foot (16 x 8 x 8 (3-4 rooms)) sized unit, and all units will be made from an aluminum skin and steel frame with a translucent top that lets in natural lighting. The door will be made from a lightweight steel and can be rolled up as you access it. If you are not sure of the size you need, you can describe the situation to the company and they will be able to guide you. On their website, they will want to know the storage address, destination and the size of the POD that you want. Once this information is received, you will get a quote for the job. They will most likely want part of this money up front as a deposit. When paid, a POD truck will deliver the POD into your designated location for the allotted time. After being stored in a driveway, it can either be dropped off at a new location or, if it was used for storage, it can be picked up empty. With the quote you receive on their website, it should include the first delivery, liability coverage, the first month of storage, transit cost, the final removal and taxes. Packing supplies and locks for the pod are going to be an additional expense. Packing supplies will include boxes, tape, bubble wrap, a dolly, etc. If you want to have your belongings protected by liability insurance, PODS does offer an insurance plan for an additional fee. Depending on the amount of coverage, it can cost about $50 per month per $10,000 worth of items. An additional fee may be applied to driveways that are non-concrete, such as gravel, dirt, etc. For every additional month that you need, an additional $100 to $200 will be added to your total bill. Hiring movers to move items to and from the pod can cost anywhere from $45 to $90 per hour. To receive multiple quotes from moving companies in your area, consider getting quotes on HomeAdvisor.com. A 12-foot POD can generally accommodate a 1,200 square foot home, while a 16-foot POD can accommodate a 1,600 square foot home. If you are only using the Pod for the renovation of a room or two, the smallest size will suffice. Try to reserve the POD well ahead of time. Due to demand, there could be months where your specific size is not available. The company operates in the United States, United Kingdom and Australia. In the United States alone, the company services 46 states, with more than 2000 locations. Most locations, depending on the location, will be run by a franchisee and the operating hours will vary. Many other moving companies offer something similar to PODS, such as ABF, U-Haul®, United-Mayflower® and Bins®. Be sure to call up the competitors and get at least three quotes before deciding on one company. Companies such as PODS do have promotional rates and codes readily available online if you search for them. Before booking, try your best to look for one to see how much you can save. Rather than hiring people to move the items for you, call up some friends or neighbors to help you out.